The Bohne Foundation took part in the annual Muscular Dystrophy Association (MDA) Summer Camp VIP Day on Wednesday, June 26th @ Camp Red Leaf in Ingleside, IL. The day was filled with fun, games and prizes for the campers. Pictured is one of the events, the Fear Factor presented by Graham. 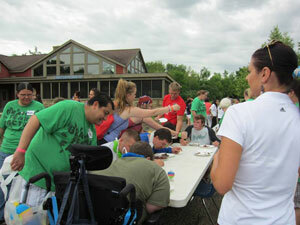 Over 60 campers (ages 6 to 17) attend the weeklong camp in Ingelside, Illinois. Here, kids with the neuromuscular disease experience a world specifically created for them, and meet many other kids who share their needs and experiences. 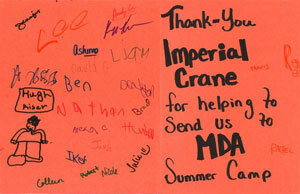 After the day’s activities, the children got together to make thank you cards for all the sponsors. Muscular Dystrophy is a brutal degenerative disease that prematurely takes the lives of so many precious children. MDA is the nonprofit health agency dedicated to curing muscular dystrophy, ALS and related diseases by funding worldwide research. The Association also provides comprehensive health care and support services, advocacy and education. Last year we helped raise over $300,000 dollars in research for a cure. This year, the steering committee for MDA’s annual Muscle Team event (chaired by Bohne Foundation president B.J. Bohne) aims to raise over $400,000. III) You may LIKE our Facebook page for ways to get involved, donate or checkout updates on events.